Some authors claim that the Sorraia is not a primitive Iberian horse, but just a breed, a color breed at that, and that the grulla and dun color was selected for by d‘Andrade. Allegedly, Ruy d'Andrade picked the foundation stock for his Sorraia project from multi-colored herds, and what he started were just a color breed. Whoever is challenging Ruy d'Andrade's work, a well-respected scientist and outstanding authority on Iberian horses, should back up his claim with hard evidence. All four grandchildren of Ruy d‘Andrade, who all have Sorraias, support their grandfather's work on the Sorraia unconditionally. Andalusians. If the horses that he strived to preserve and named „Sorraias“ had been a man-made breed, he would have known about it. Nor was it his intention to create another breed. He had preservation on his mind, not the creation of a new breed. If he was convinced to have found in the Sorraia horse a remnant population of an indigenous, wild Iberian horse, then he was a lot more qualified to draw that conclusion than anyone today, many decades later, without personal knowledge of the situation then and the surviving horses. D'Andrade has lectured on this horse in 1935 at the XII. International Zoological Congress in Lisbon—there is no way he would have risked his reputation as a scientist by introducing there a horse as an indigenous primitive animal that he knew was just a domestic breed, or a feral horse! In all his many publications he consistently treated the horse that he called Sorraia as a direct descendant of a primeval horse, ancestral to the Andalusian and Lusitano. "…in 1920, on a hunting trip in the region of Coruche, on the lower Sorraia (river), on the 'Sesmaria' land, I saw a herd of ca. 30 individuals, more than half of them were light duns, some were grullas, many with superabundant stripes, and generally in all aspects absolutely wild, or primitive, as if they were a species of zebra, or a hemionus (halfass) species." Please note: There is no mentioning of "grey" (as found in some translations). Portuguese for a grey horse is "ruço", for grulla it is "rato"; d'Andrade used the term "rato". In no way did d'Andrade imply here that this wild herd was multi-colored. He did say that more than half of these Sorraia horses were light-colored duns—he did not mention how many were darker duns, or how many were grullas, or how many were duns or grullas with less pronounced striping. Granted, this account leaves the possibility that a few of the horses were of a different color, but he didn't mention any. And even if there had been a few of different color, that would not prove him wrong in recognizing these horses as a primitive remnant population. All that would prove is that the horses he found weren't pure anymore—something that can be taken for granted anyway. "Later, in 1920, on a hunting trip in the region of Coruche, on the lower Sorraia (river), on the 'Sesmaria' land, I saw a herd of ca. 30 individuals, more than half of them were light duns, some were grullas, many with superabundant stripes, and generally in all aspects absolutely wild, or primitive, as if they were a species of zebra, or a hemionus (halfass) species." Ruy d‘Andrade then went on to explain that, after this experience, he paid more attention to the characteristics he observed in this wild herd and that he found more than 300 animals with these characteristics in the valley of the Tejo, in the Alentejo region, and in the valley of the Guadalquivir. A possible presence of atypically colored horses in those last Sorraias which d'Andrade found could hardly come as a surprise in a population that was on the brink of extinction and therefore must have included some crossbreds. In no way does it mean—let alone prove—that grulla/dun wasn't the original color of these horses. Dr d'Andrade's research convinced him that grulla/dun was indeed the color of the Sorraia horse, and the Iberian wild horse has always been a dun-factor, convex-headed horse according to historic data spanning over 2000 years—if the prehistoric cave paintings are taken into account, even much, much longer. The color situation can be explained by way of an example: The Mallard is the most common wild duck in Europe, and the ancestor of our domestic duck breeds. The Mallard has well adjusted to people and cities, and in many areas it interbreeds with domestic ducks. On many rivers, lakes, and ponds, particularly in parks and near villages, one can see wild ducks whose colors betray some domestic parent or grandparent: some odd colors, some white markings, some that are even predominantly white. In some places these odd-colored hybrids make up nearly half of the wild duck population. However, there is still no question about what the original color of the wild Mallard is! If we assume for the sake of argument that for some reason the mallard became almost extinct and all that was left were a few dozen or so—chances are that some of those remaining ones would be off-colored hybrids. Now, if you were to step in at the last minute and preserve the Mallard for future generations, would you pick the odd-colored ones, or would you rather pick the ones that are of the true wild color? And if later in your conservation project group some odd-colored ones would crop out, would you not cull them in order to preserve the Mallard as it originally was? Well, that is exactly what d'Andrade did in regard to the Sorraia horse. And preserving, reconstituting the Mallard in that way would not render the resulting ducks a breed, nor would it cast any doubt on the wild status of the thus conserved Mallard population—in spite of the fact that the founding ducks came from wild ducks of varying colors. It is irrelevant whether there were some horses in that first herd that showed mixed ancestry by way of a different color, or in the herds d‘Andrade picked his foundation stock from. What is relevant is that d‘Andrade—a scientist and horse expert of the highest reputation—selected the horses which, according to his knowledge, represented the indigenous wild horse of that region. This he maintained in all his publications, this he tried to document through the evidence he found in his research. Again, whoever claims he was wrong should provide evidence to the contrary. 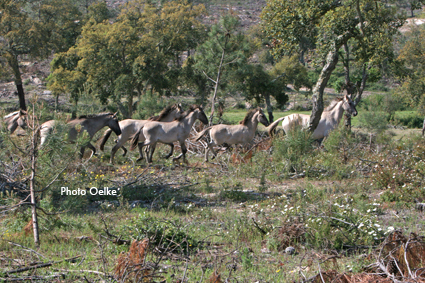 The Iberian wild horse, the zebro, named „Sorraia“ by d‘Andrade, was a grulla resp. dun-factor horse; that is born out by the fact that in Portugal the term for wild horse was "zebro" or "zebra", because of the stripes. Field names like Vale de Zebro (wild horse valley) still exist. Because the Portuguese were used to wild horses having stripes, they as a matter of course called the wild horse they encountered in Africa also "zebra", thus lending that name to another species. Finally, state-of-the-art technology provided results which show that Sorraias have indeed a singular status. While the moleculargenetic method of mitochondrial DNA sequencing did not back up d'Andrade's assumption that the Sorraia is the only ancestor of the Lusitano and Andalusian, the results are consistent with it being one of the ancestors, possibly the most important one. It also did prove Sorraias to be a genetic treasure! Jansen et al. in their work "Mitochondrial DNA and the origins of the domestic horse" **) found mainly two genotypes in all Iberian horses, the A1/A3/JSO41 and the D cluster. The A1 and JSO41 types found in Sorraias were found to belong in one large group with A3, and the whole genotype is also that of the Tarpan. It is incredible that Ruy d'Andrade in his Sorraia project picked his foundation horses only armed with nothing but his expert eye, going by primitive phenotypic characteristics, and saved horses which we now find to have a singular mtDNA type! As Sorraias have their own very old genotype, a primitive phenotype it most likely shares with the Tarpan, and as they had maintained wild behavior, and as they had no history as a domestic breed, it appears that the remaining Sorraias are a remnant population of a true wild horse form, resp. a subspecies. The Sorraia has no history as a breed. If the wild horses in Portugal, of which d'Andrade discovered and saved the last remaining ones, have not been pure anymore, that still does not make them a breed, nor a feral population. A feral population is one of domestic horses that reverted to a wild state. Again, the Sorraia was never a domestic horse to our best knowledge. And we know what feral populations look like: they do not have a uniform phenotype, which—in spite of outside blood that it must have absorbed—the Sorraia horse did have and still had at least to an extent that allowed old Portuguese people who knew them to readily recognize one if they saw one. A uniform phenotype is something found only either in wild animals and in breeds, but in breeds it is the result of generations of concentrated selection efforts. Domestic breeds are a cultural accomplishment, and cultural accomplishments find their reflection in peoples' histories. Again, the Sorraia has no history as a domestic breed. Mitochondrial DNA sequencing has been employed to research the Sorraia horse's relatednesses and phylogenetics. Mitochondrial DNA sequencing is the state-of-the-art technology. In contrast to nuclear DNA, mitochondrial DNA (mtDNA) cannot be altered through selective breeding! Mitochondrial DNA is the only reliable method to determine relatednesses between breeds and/or populations, and relatednesses of individuals to populations. In the latter case, bloodtyping for instance would fail completely. Mitochondrial DNA is THE instrument to determine phylogenetic facts, i. e. historic relationships. For instance: Japanese geneticists first established through mtDNA sequencing that the Mongolian wild horse (Przewalski's horse) is not an ancestor of domestic breeds (later confirmed by Jansen et al.**). So for the Sorraia horse's status, mtDNA research was the only conclusive method. By the way, mtDNA sequencing proved also that the Neanderthaler was not an ancestor of Homo sapiens. Although mtDNA is passed on only through the maternal line, the presence of a certain mtDNA pattern proves beyond doubt that an animal is indeed related to the population for which that pattern is typical, at least through the maternal line. Through mtDNA sequencing, Jansen et al. proved that our domestic horses stem from several different post-glacial wild horse forms, or subspecies, and that domestication of the horse took place in several geographically distant areas. The Sorraia horse represents a distinct mtDNA type. As far as geographically-linked genotypes are concerned, Jansen et al. established those for North/Northwest European ponies, for the Mongolian wild horse, and for South Iberia/North Africa. Depending on how one looks at the results, two or three South Iberian genotypes were established: one found in most Andalusians and Lusitanos, as well as Barbs (D cluster), another one found in many Lusitanos (A3), with the third one being that for the Sorraia (JSO41 resp. A1); latest results, however, imply that A3 and A1 as well as JSO41 all belong to one and the same large cluster (genotype, or haplotype, or supercluster). Sorraia horses are therefore relatives of the Andalusian and Lusitano, and could well have been their ancestors. Andalusians and Lusitanos for a long time represented one and the same breed, and were only rather recently divided into separate studbooks/registries. The fact that a different genotype than the D complex is found in a rather large percentage of Lusitanos and Andalusians, namely A3, shows that they go back to two wild ancestors. From what we know today, this second wild ancestor must have been the Tarpan, as its known direct descendant, the Polish Konik, shows both patterns, A1 and A3. Two mtDNA patterns can be found in the Sorraia horse (A1 and JSO41), which are closely related and represent two similar boughs on the same branch of the phylogenetic tree. 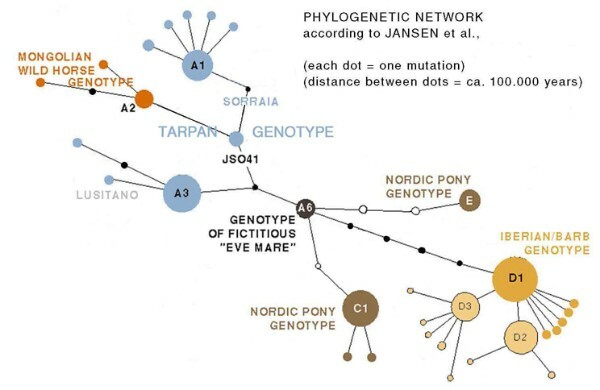 The A3 pattern of the Lusitanos in turn is only two mutations apart from JSO41, and for reasons which to discuss here would be beyond the scope of this article, molecular geneticists consider A1, JSO41, and A3 all variants within one large phylogenetic cluster. The mtDNA patterns found in Sorraias can also be found in some other horse breeds. This is only natural, as our domestic horse breeds are usually a mix of populations, types, and breeds, a mixture of genotypes is therefore usually found in horse breeds, and the genotype of the Sorraia, or Tarpan, in horse breeds is thus easily explained. The mtDNA results are consistent with the presumed role of the Sorraia as one of the ancestors of those breeds. All 18 Sorraias sampled for this study had one of two mtDNA patterns (A1 and JSO41), both on the same branch in the phylogenetic network, and closely related to one of the two major mtDNA types found in Lusitanos and Andalusians (A3). 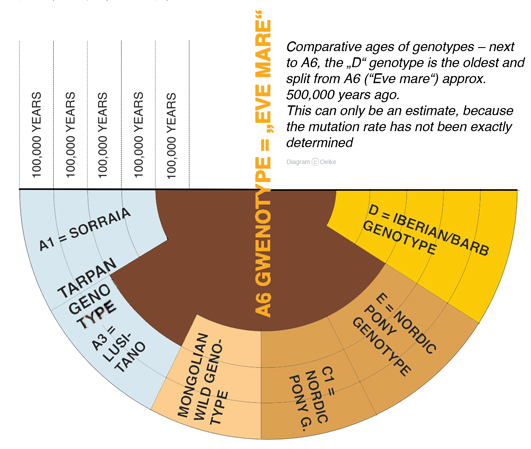 The genotype found in Sorraias is completely unrelated to the other genotype found in Iberian horses (D1). This is remarkable regarding the status of the Sorraia. The Mongolian wild horse provides another geographically linked genotype (central Asia). It was found in this study that two mtDNA patterns exist in the Mongolian wild horse. ISHIDA et al. have published a third mtDNA pattern for it, but all three are closely related, and somewhat different from the Sorraia. JANSEN et al. found that the Mongolian wild horse has played no ancestral role in regard to domestic horse breeds, because the mtDNA patterns of the Mongolian wild horse were not found in any other breed or race. This is in agreement with ISHIDA et al., who had sampled only a few horses, while Jansen's new results were based on a much greater number of individuals.